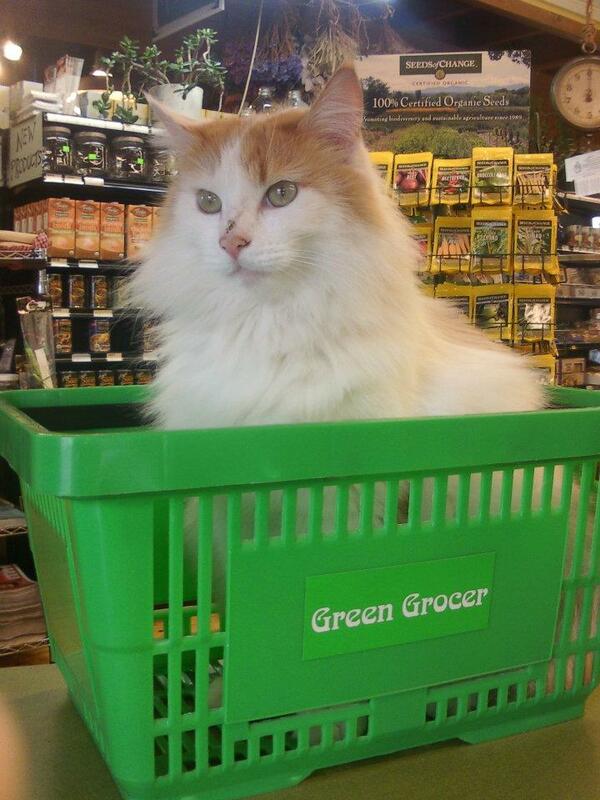 I awoke to the sound of despair yesterday, the wailing of my wife as she had just learned of the tragic death of the Green Grocer’s shop cat, Frederico. I rushed down the stairs to learn this for myself and immediately the tone for the next untold number of weeks was set. Our 16 pound long haired white and orange friend to all had been taken from us abruptly by vehicle in the night. I don’t know who the driver was or if the slaughter of an innocent soul was their desire or intention but I can attribute a handful of qualities to this person and if karma is a force that exists in the universe then this person has some rough times ahead of them. My wife and I rushed to the store seeking more information since we were unable to contact our informant directly where we were able to tend to the body once inhabited by one of the friendliest creatures that had ever graced me with their presence. In times like these we are flooded with a number of emotions which prompt a number of questions among which include the why’s and the how’s of the tragedy but ultimately I think we find that the details matter little and all we have is the wake of what is left behind. This includes lifeless staring eyes and the absolute devastation from such a traumatic loss not unlike the ripping of an organ from your living body. This is only an account of how I feel. The collective grief of an entire community which is sure to follow can only be described as overwhelming. We wrapped him up in his favorite blanket which he often slept on when kept in the shop overnight and laid him beneath the old tall tree which shaded the store, the tree under which he had spent countless lazy days basking in whatever sun the Oregon sky could spare. He was not flipping back and forth mindlessly deriving whatever strange pleasure he received from immersing himself in the dirt but he still seemed oddly at peace on that overcast morning. I sat there completely at a loss for words next to my wife while we waited for the store owner to come claim her fallen companion. It was an inexplicably cold morning for late July and our extremities numbed but we would not be moved from watching over our friend until we could be certain he was tended. In moments like these the brain goes into an unusual state whereby emotions run things for a little while. You try to make sense of the situation but often find yourself looking for a place to lay blame. Some people place it on the driver, others place it on God, and others still place it upon themselves as irrational as that can be. These are the moments that remind us that we have one of two positions we can take in our power struggle with universe around us both with inescapable consequences. In my heartbroken daze I chose to observe little white spiders as they went about their day, crawling across whatever lay in their path. They traversed the blanket that bound our friend and I wondered inwardly if they had any awareness of the tragedy evidenced by the cold presence in their domain. Did they mourn their dead or did they simply go about their daily business perpetually accepting their existence as what it was? At the base of the tree was a type of grass or weed that reminded me of wheat. They were no more than six inches high and when I ran my fingers upward along the stock small seedlike pods became dislodged and dropped to the ground. I assumed they would eventually take root and grow into new stalks where the cycle would start all over again. The ground was thick with brown lifeless stalks between the green standing stalks. From where I sat on the cold ground, the dead stalks outnumbered the living ones 3 to 1. From the perspective of a human I translated this in my mind, imagining mankind mired by the dead in similar proportion. Was this a reality hidden by the habit of burying and burning our deceased? This was a subtle reminder to me that we are not unbound by this harsh cycle of life. I tried to comfort myself with this thought but could not shake that poor Frederico was not given the chance to complete his part of the cycle. It is hard to justify the ending of a life by way of ignorance or malice. It is a true test of fortitude that stays your hand from reciprocation in tragedies like this. Was it chance, fate, or evil that did this thing? In either case my eyes were drawn to the weeds that had prevailed through a raised crack in the asphalt of the parking lot and I was reminded that time will ultimately do its part. I am not a religious man but I consider myself a spiritual one in a way. I know that Frederico will go where he needs to go and I know that somewhere new life drew breath. Perhaps a beautiful newborn kitten entered the world with the destiny of bringing another person untold joy. Certainly Frederico’s body will release its energy to the garden under which he was buried and nature will express her gratitude in beautiful and bountiful ways. How can she not be grateful to receive back a beautiful thing which she created to experience the universe. I take solace knowing she will take that experience into herself and get to feel the intense collective love that Frederico drew from everyone around him. He will be missed. Interesting take on “not being a religious man”. You sound very “religious” (by definition) with your beliefs/thoughts of the afterlife, whatever that may be? I am guessing Frederico had crossed that road umpteen times. Why this time? That vehicle? Good questions with no answers. The cycle of our universe is never ending. All living things will complete their cycle at an undetermined time. We must all go through that same door into whatever is on the other side. Something is there. I pity the person who has no hope or wonder of what that is. I am encouraged that you are not one of them. Thanks for the thoughts.